Life is uncertain. Eat dessert first! We’re back to the Orange Boycott this week with Double Orange Pineapple Whip, and damn, was this ever a good week for it. I won’t waste time recounting our weekly presidential shitstorm, but it’s feeling pretty good to be able to type Orange today. The thing with Double Orange Pineapple Whip is that it’s a pretty simple recipe, and I felt like taking pineapple a little further, so I decided this was the week I was finally going to make a Pineapple Upside Down Cake. I remember liking this a lot as a kid, but, weirdly, Bryan had never had it. Admittedly, it’s one of those “white trash” recipes that get made with canned this and boxed that, but I suppose part of the reason why I wanted to make it was that it was potentially a comfort food. Thinking about it, that’s a little weird given how uncomfortable my childhood was, but it’s in keeping with the spirit of the Project, so there. First thing, I needed a recipe. I thought in our bookcase full of cookbooks there must be a decent one, and the first book I reached for was my trusty 1980s vintage Betty Crocker cookbook. There was a Pineapple Upside Down Cake recipe, but for the cake part it specified “buttermilk baking mix” (a//k/a Bisquick). My recollection (and preference) was that it was made with yellow cake, so I kept looking. My antique Better Homes and Gardens cookbook didn’t have a recipe for this at all, nor did White Trash Cooking, which really surprised me since Pineapple Upside Down Cake would fit in nicely with the ice box cakes and “dump cakes” featured in that book. Bryan found a kind of fancy-sounding recipe that involved making the cake from scratch, but that wasn’t really what I was looking for. I finally turned to Mr. Google (which, let’s face it, has largely replaced promotional cookbooks), where I found that Betty Crocker had posted exactly what I was looking for – and it was so simple that I almost felt silly needing a recipe. All it took was a quarter cup of butter, a cup of brown sugar, a can of pineapple slices, a jar of maraschino cherries, and a box of Better Crocker Supermoist yellow cake mix. Looking at a picture tells you pretty much all you need to know to make it. The only non-obvious part was the substitution of the pineapple jiuce for the water in the cake mix. It made the whole house smell amazing while it was baking. That really made the endeavor worthwhile, although I wasn’t 100% satisfied with the result. The main thing was that I think I should have used light brown instead of dark brown sugar. The other thing was that I guess I handled the cake a little too roughly while it was hot (you’re supposed to flip it onto the serving plate right out of the oven) so it sank a bit in the middle. Still, I served the first bit warm with vanilla ice cream, and it was tasty, albeit very sweet. Bryan wasn’t terribly excited by the whole thing, but he rarely turns his nose up at cake and ice cream. I thought it was okay, but maybe not the comfort food I had been hoping for. I made Double Orange Pineapple Whip while the cake was cooling. It started with bringing seven ounces of ginger ale to a boil (I know – what? ), dissolving a three-ounce packet of Island Pineapple Jell-O in it, and adding a cup of pineapple juice (hence, “Double Pineapple”). I chilled it over an ice water bath until it was slightly thickened and then whipped it up with Mixmaster Junior until it was light and fluffy.. I divided the fluff among four dessert dishes and put them in the fridge to chill overnight. I was happy to see that the Jell-O stayed foamy as it chilled, so that there was no weird, creepy layer of solid gelatin at the bottom. I tasted it after getting home from the gym this afternoon, and while I topped it with whipped cream for the photo, I don’t think the garnish was strictly necessary for the eating. The foamy Jell-O was kind of fun to eat, and it was light and refreshing. (It also gave rise to a couple of good, solid belches, if you’re into that sort of thing.) Bryan said it was “very citrus-y”, and I agree that the flavor was good. In fact, I suspect that Double Orange Pineapple Whip was better than the original. This is one that I would encourage the interested reader to make. The base of Richlieu Mold is “any red flavor” Jell-O. I went with cherry, partly because I’m getting a little tired of strawberry, but also because one of the ingredients is cherries and I didn’t want to throw too many different flavors in there. I’m calling this an Orange Boycott recipe because, even though orange Jell-O is in no way involved, the other fruit ingredient is, officially, orange sections cut into chunks, and there’s supposed to be a couple of tablespoons of orange juice in the Jell-O liquid. Anyway, it just feels fitting, now that we’ve passed the 100-day mark (and the “100 days since the Women’s March” point), to make a gesture like this. As a substitute, I used canned pineapple chunks, and two tablespoons of the juice from the can. I like pineapple. The recipe includes a topping, which can be either Dream Whip or Cool Whip (I chose Dream Whip because that’s what Bryan prefers, although to my mind each is creepy in its own special way) mixed with toasted slivered almonds. I toasted the almonds myself, and that was probably the most pleasant part of making this recipe, because toasting almonds smell nice, and it felt good to have the oven going earlier this afternoon on what turned out to be a chilly day – strange, because yesterday was quite warm and humid. Not surprisingly, the gelatin part is just fruit suspended in Jell-O, so the prep was pretty routine – make the Jell-O as usual, using the canned cherry and pineapple juices instead of cold water, thicken over an ice water bath, fold in the fruit, put it in the mold and chill until firm. For some reason, the Jell-O was quite stubborn about coming out of the mold this time. (Yes, I remembered to lube the mold!) It wouldn’t unmold until it had been warmed in a water bath to the point of being definitely melty, so it came out looking untidy. I hate when that happens. For eating it’s a perfectly decent dessert, although I can’t quite get over my particular squeamishness about canned cherries. I mean, I ate them, but it wasn’t a pleasant experience. The pineapple chunks are fine in this, possibly better than orange chunks would have been. I prepared the Dream Whip with almond extract instead of vanilla extract, and the extra almond flavor goes well with the gelatin. One small gripe is that the toasted slivered almonds are an odd textural addition to the dish. I found that I had to be conscious of chewing each mouthful thoroughly so that I wouldn’t end up choking a bit on inadequately masticated almond bits. Bryan didn’t have this problem, though, so it was probably just me being lame. Bryan declared that the cherry flavor was overwhelming, and maybe it was – but better that than orange. At last, I get to do an Orange Boycott post! (After the last couple of weeks, I was really looking forward to this.) As you can sort of tell in the photo from the book, Banana Nut Ring calls for orange Jell-O. I substituted Island Pineapple flavor, which I think tastes better anyway. This recipe is a two-parter. First, there’s the ring mold, which is simply Jell-O with banana slices and chopped pecans stirred into it once it’s thickened up. There are a couple of issues with this. The first, as I’ve noted in Mardi Gras Mold and Honey Pecan Bavarian, is that nuts in Jell-O are just weird. Those are two textures that do not go well together. Luckily, I like pecans, so this one wasn’t nasty on top of being weird. The second is the bananas. I had to try not to be too annoyed, because it’s just “banana nature”, but the slices would stick together (which I had discovered with Peach-Banana Dessert but I guess it didn’t bug me as much then). You would think that once you add banana slices to a bowl of thickened Jell-O, the Jell-O will act as a coating or lubricant to keep the slices separate, but as much as I stirred and tried to separate them, the slices kept clumping up. It’s best to look upon this as an exercise in patience. Anyway, I whipped up the Jell-O ring and chilled it overnight. Upon unmolding it, I discovered one small drawback to using the Island Pineapple flavor – the mold was a very odd color, I think rather like how Bryan sees green things because of his colorblindness. On the other hand, the peculiar yellow-brown hues reminded me of color palettes that were popular in the 1970s, so that was kind of a happy accident. Okay, not so much happy, but appropriate. The second part of the recipe is the “Ginger Topping”, a bit of a misnomer because it’s pretty thick, and it gets piled into the center of the ring mold rather than spread on top of it. This is just a batch of Dream Whip with crushed pineapple and slivered candied ginger folded into it. Tasting it, I decided that the Ginger Topping is a bit of all right. Because of the fairly strong vanilla flavor of the Dream Whip, it reminded me of pineapple upside-down cake, which I haven’t had since I was a kid, but I may have to make it sometime soon, even if I have to use a store-bought cake mix to do it. Also, it reminded me of ambrosia salad a bit, plus I dig candied ginger (I was noshing on it while cutting up what I needed for the recipe), so what’s not to like? The finished product was straight outta the 1970s, and I was pleased. The photo looks strange, but I swear that was the actual color of the thing. It was like someone had sent it over in a customized DeLorean, express delivery from 1974. For eating, this was surprisingly good. Yes, I’m saying “good”. For once, the flavors blended together nicely in a tropical (that is, southern United States) mélange. With the topping, it was easy enough to overlook the peculiar textural note of the pecan chunks in the Jell-O. The flavor of pineapple was predominant, but the pecans, bananas, and Dream Whip were assertive enough. I would have liked more ginger flavor, though; rather than trying to sliver the slices of crystallized ginger, I should have chopped them up fine so that they’d be more thoroughly distributed throughout the topping. The main drawback to this recipe was that it was relatively straighforward and quick to make, and while preparing it and listening to music took me to my happy place for a while, I didn’t get to spend enough time there. On the positive side, once I hit “publish” on this one, I’ll be all caught up with my editorial calendar, and that’s one less thing to feel crappy about. Woo hoo! I’m not sure, but I think this recipe may have been included in the book as a joke. 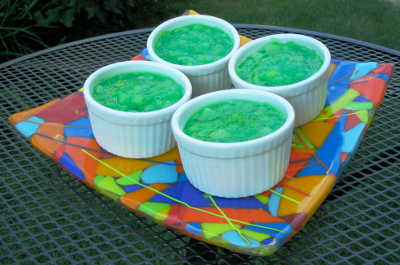 The ingredients are lime Jell-O, crushed pineapple, peppermint extract, and vinegar. The proportion of pineapple is fairly sizeable, and this made me nervous as I’ve been warned by a few different people that I should be careful when using pineapple because it contains an enzyme that inhibits gelling. In theory, this could be a refreshing summer dessert – or something else entirely. However, this appears not to have been a problem here. It’s difficult to tell from the photo, but the Jell-O in the ramekins is, indeed, fully set. I had intended to unmold the Jell-O from the ramekins onto the plate, but it would not come loose, despite the little knife and the warm water bath. I assume the ceramic wasn’t transferring the heat as well as, say, my metal bundt pan. Oh well, another Jell-O lesson learned. I may have to invest in some Pam for future recipes. (It’s not a General Foods/Kraft product, so naturally the Jell-O folks aren’t going to recommend using it.) Another little problem with using the ramekins is that I find myself wishing they contained crème brulée instead. It would have been helpful if the recipe book had included a serving suggestion for this one, because I honestly have no idea what place this might have in a meal. Texture-wise it is rather like your more traditional relishes, in that the gelatin serves mainly as a binding agent for the crushed pineapple. Flavor-wise, I’m not sure what would be enhanced by this. The flavor is, to put it generously, complex. At first it’s just “mmm, lime Jell-O and pineapple, this is a bit of all right” and the vinegar just seems to enhance the tartness, which is something I like about both lime and pineapple. But then the peppermint sneaks up on you, and you wonder what the hell it’s doing there, like some kid in a crowd jumping up and flipping the bird in the background of a video of two dignitaries shaking hands. I’m thinking maybe you could have this with Nilla Wafers in a course somewhere between the salad (iceberg lettuce wedges with bleu cheese dressing?) and the dessert (something involving Cool Whip, definitely).